In the last couple of months, some great MMO strategy games have released for Android devices such as Dino War, Iron Throne. And Empire Origin is one of them. The gameplay of Empire Origin game is similar to these games; all you need to set up your base, train troops, install traps to defend the castle from enemies and attack enemies/monsters. In this post, we have covered everything about the game you need to know; Empire Origin guide, tips, cheats & strategy to play like a Pro! Before we move to guide and cheats, tips part, let’s learn the basic of the game; how to play Empire Origin, your objective, and much more. However, the tutorial covers everything like upgrades, about population, buildings, and more. But if you have not yet played MMO strategy game, then you should read the basic. The Basic -> In Empire Origin game, your primary objective is to build the best city and defend your city from enemy attacks. Other players can attack your base and loot your resources such as food, wood, gold, and much more. You can also attack enemies and loot their resources. All you need to do is build the best army to destroy the enemy city. Set up the defense to protect your resources. And upgrade all the buildings. At the beginning of the game, most of the buildings are locked and to unlock these buildings, you need lord EXP, can be obtained by completing the quests. Let’s start the Empire Origin game guide and after it, check out our Empire Origin tips, cheats & strategy guide to build the best city and loot more resources. In this part, we will learn about all the buildings, how to research, about skill points, how to increase power, how to attack enemies, about scouting, how to set up the defense, and much more. Let’s start the Empire Origin game guide without wasting time. Since it is MMO strategy game and you have to build a great city, you should know about all the buildings and what is the importance of buildings in this game. Let’s earn about each building. The house is the main building in Empire Origin game. House level determines the population of your city. A large population means you can recruit more people in producing resources such as food, wood, in mining, and more. Upgrading house building increases the population limit. The college is one of the important buildings in Empire Origin game. Here you can research on various aspects such as resources, development, military, city defense, and much more. All you need to do is tap on the college building and choose research. After it, choose a research topic(i.e. city defense) and then start research. Researching costs you “Technology Points”. You can generate technology points by assigning population on research. Tap on the city hall -> manage the population, tap on the + icon next to research to assign population. You can check the number of points generating per hour just below the research text. The Barracks buildings get unlocked after you level-up. Barracks; Infantry, Cavalry, Archers, Chariots, and more. Tap on a barrack building and choose train to train your troops. You can send troops on a march or gather resources on the world map. At hero hall, you can train heroes and earn auto-battle rewards. Just tap on the hero hall and choose the campaign option. Then tap on the loot option to collect the reward. Tap on the hero option to check heroes list. At the hospital, you can heal injured troops(sent by you on a march). Upgrade it to increase the wounded capacity. Resources buildings such as farms, wood depot, iron depot, and more are important buildings; you assign your population on these buildings to produce resources such as good, wood, iron, and much more. These resources are required to upgrade or construct buildings. All you need to do is keep upgrading these buildings and increase the production. At Blacksmith building, you can craft gears for your lord. Obtain crafting material by slaying down the monsters or by getting victories in the battles. 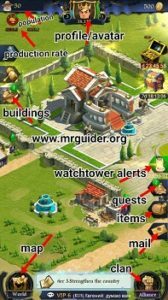 In Empire Origin game, the Watchtower building is the best building. It alerts you about the enemies approaching your city to steal your resources and damage all the buildings. Upgrade it to get more details on enemies. Drill Ground is another building in Empire Origin game, upgrade it to increase the limit of soldiers you can send on marches. At defense hall, you can build traps for the enemies and protect your resources and buildings. Upgrade this building to unlock new powerful traps. So, this is the building guide. Now, let’s learn how to attack monsters and enemies. To attack a monster, tap on the search icon(at the bottom left screen) and choose “monsters” and select its level, then hit on the search icon. After it, you will see the monster. Tap on the monster and choose attack; select the troops and start marching. To attack an enemy, tap on base on the world map and choose attack. Before you attack, tap on the scout option and spy enemy base; to check the defense level, the power of an enemy. 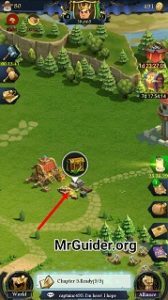 Once you confirm, your troops will go there and within a certain amount of time, you will get the report about the enemy; check the inbox; tap on the mail icon(at the bottom-right). Check the report and compare its power with yours; if your power is high, then attack. You can also collect resources such as food, wood, iron, and more on the world map. Just tap on the search icon, choose the resource and hit on the search option. After it, tap there/resources and send your troops to collect resources. 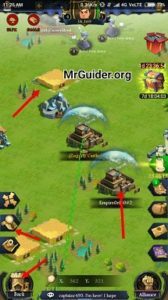 How to set up the defense in Empire Origin game. AT the top of the screen, tap on your avatar icon. After it, tap on the books icon – Here you can use your skill points for bonus advantages such as combat, development, and support. Tap on the combat and choose a skill(just tap) and then tap on the learn option. By activating combat skills, you can increase your troops’ power or improve the combat performance. Learn development skills to reduce upgrade cost, increase the production, and resources income. Learn support skills to speed up marching when attacking monsters, speed-up recovery, and much more. How to obtain skill points? -> Level-up. How to level-up? Complete quests, chapters, and upgrade buildings, and additionally, attack or slay down the monsters. Let’s learn Empire Origin cheats, tips, and the strategy guide to progress fast. 1.) At the beginning of the game, focus on quests and level-up. Leveling up unlocks new buildings and upgrades. 2.) Upgrade your houses and increase the population. Then assign population on farms, wood depots, iron depots to increase the production of resources. 3.) Start research on city defense at college and build traps at defense hall to improve city defense and save resources from enemies. 4.) Upgrade watchtower to get more details about enemies approaching your city. 5.) Train your troops; upgrade barracks to unlock powerful troops. Upgrade drill grounds to increase the march capacity. 6.) Craft gears at the blacksmith, tap on your avatar(at the top center) then tap on an empty slot and equip the gear. 7.) Use skill points to learn new skills and get bonuses. 8.) Attack monsters, enemies and earn crafting material, EXP, and more rewards. 9.) Near the Dak, hospital, watchtower, there is a free reward producer. After every few minutes, you can collect rewards from there; rewards such as free speed-up, gold, and much more. 10.) Join an alliance and get free 200 gold. Go to settings -> account -> bind your account and get 200 free gold. To claim this reward, tap on the mail icon and tap on the reward message. 11.) Before you attack an enemy, grab the details about its castle by using the scouting feature. 12.) Keep upgrading and improving!